Spying on the bees as they go about their outdoor pursuits has become something of a passion, and stalking them as they forage round and about the house has opened my eyes to all the various snacking places on offer. Some of these floral opportunities are ravaged in the wink of an eye, others last a little longer. 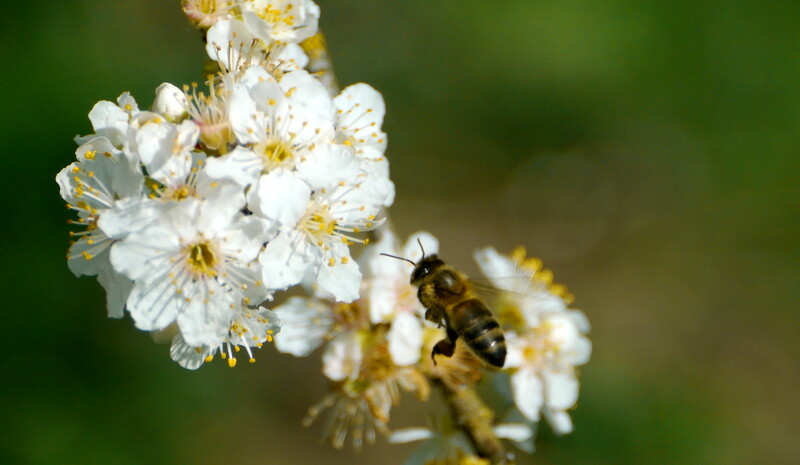 It certainly surprises me how quickly a tree / flower / shrub can be devoided of pollen. The two main areas of activity this month have been the fruit orchard and the box trees. In the orchard it started with the almond trees, and then the wild, flowering plums. We have two, young, purple-leaved Prunus trees, which have pink flowers, and then a host of a white blossomed varity, which must have been here for decades. The blossom on the old ornamental plum trees makes it appear as if the snow has returned. In summer, these bear heaps of small plums, which look fabulous but sadly are not good for eating (not even for making jams or chutneys). Regarding the box (Buxus sempervirens), there are several smaller shrubs in the garden and one large tree, about 3 metres tall – Im guessing that that too has been around for decades. The box tree is monoecious – plants have their male and female parts on separate flowers, but together on the same plant. Flowers are green and grow in clusters in the leaf axils. Each cluster contains several male (staminate) flowers with conspicuous whitish-yellow anthers, and a terminal female flower containing a three-celled ovary. 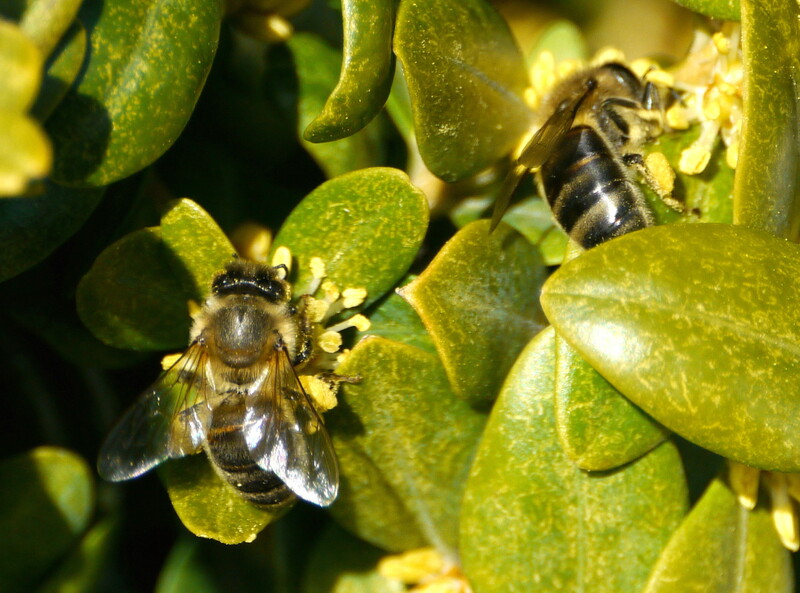 Buxus flowers are not showy, but are quite fragrant. The female (pistillate) flower is small, star shaped and yellowish green. 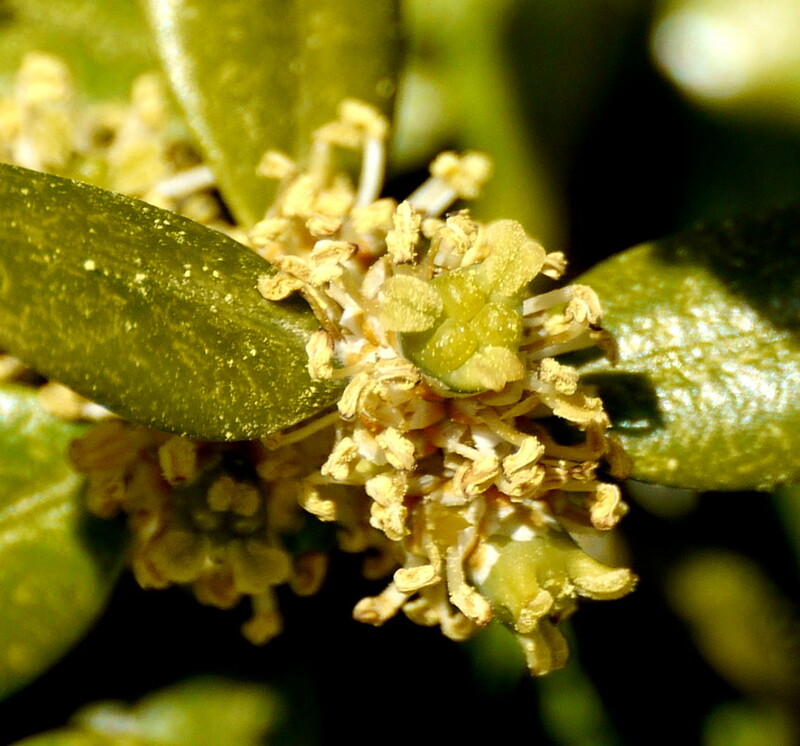 The star points are actually sepals – boxwood flowers have no petals. 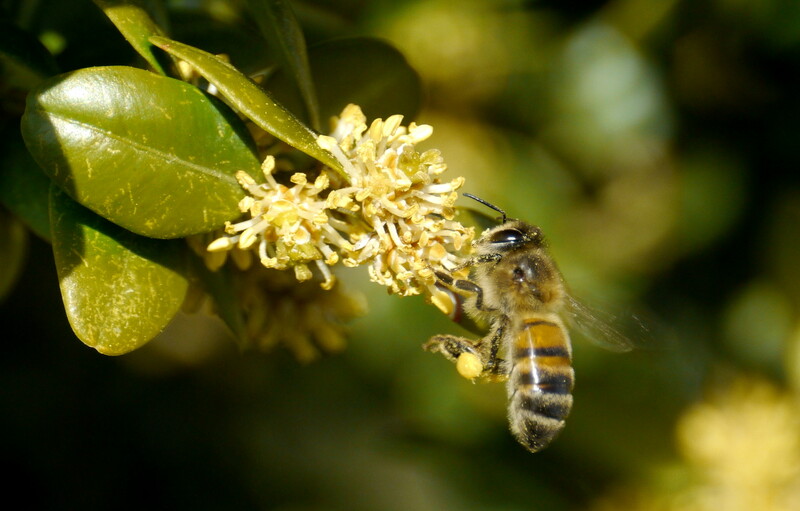 I am another bee stalker but I don’t have any buxus in the garden and I didn’t know it was perfumed, so I appreciated the info. Nice to see the bees out and about! Very good photos and botanical knowledge.